Inspired performances, a warm and relaxed vibe, and an ideal setting combined in a thoroughly enjoyable experience at Thursday’s “Meditations and Revelations” concert at MacPhail Center for Music’s Antonello Hall. 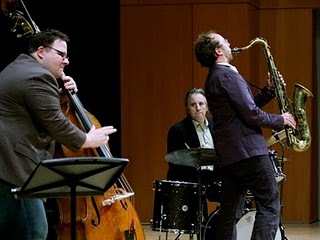 Created by MacPhail’s jazz coordinator Adam Linz, supported by a grant from the NEA, “Meditations and Revelations” is a four-concert series showcasing the music of jazz bassist and composer Charles Mingus, one of the most important figures in 20th century American music. Thursday’s concert, titled “Please Don’t Come Back from the Moon” (after one of Mingus’s compositions), was the first in the series, and it got things off to a great start. All the musicians were in top form, whether playing together or soloing. The solos were delicious in the Antonello’s superb acoustics. (The Antonello is a small hall, seating 250 tops, wrapped in honey-colored wood and velvet curtains. Instruments don’t need amplification, musicians can speak from the stage without a mic, and even if you’re sitting in the back, you’re near the front.) Thomson’s tenor saxophone wailed, soared, and whispered; in the bebop bursts of “Slippers,” you could hear each note, and “Duke Ellington’s Sound of Love” was gorgeous. Ikeda used every voice in his drum kit, from bass to rims to splashy cymbals, adding layers of rhythm and texture to the mix. Many jazz musicians today play Mingus’s music. Tribute shows aren’t uncommon. In New York City, the Mingus Big Band, Mingus Dynasty, and Mingus Orchestra, all managed by the composer’s widow, Sue Mingus, play his works exclusively (there are plenty to choose from). But it’s rare for anyone else to devote a year to studying, performing, and teaching his challenging, mystifying work. That — along with the quality of the music, the musicianship, and the hall — makes this series worth noticing. Thursday, Nov. 18: “Meditations and Revelations” concert II: “So Long Eric.” A quintet: Michael Lewis, saxophone; Greg Lewis, trumpet; JT Bates, drums; Adam Linz, bass; Bryan Nichols, piano. Thursday, Feb. 3: “Meditations and Revelations” concert III. Not yet titled. This concert will be performed by a nonet. Thursday, May 12: “Meditations and Revelations” concert IV. Not yet titled. This concert will feature a septet. All concerts are at 8 p.m. at Antonello Hall, MacPhail Center for Music, 501 South Second St., Minneapolis. Each will be preceded by a Q&A with the artists starting at 7 p.m. Tickets ($10 adult, $5 youth) available by phone (612-767-5250) or at MacPhail.